We’ve changed seasons. The average daily temperature has dropped below freezing, and it looks like the actual inflection date was November 7th. Effectively, that’s when freezing became the fashion, rather than the fad. In the week before that, average temps were right around 0°C, except for a mild Sunday on November 4. Sunday, November 4. The pond by the Scenic Nook trail on Tunnel Island had mostly frozen over. On Wednesday the 7th, the daily average dropped to -4°C, and in the following week it went as low as -9.5°C. The forecast calls for fairly consistent low temperatures in the next weeks, and let’s face it, we’re not going to start any serious melting in December. Remember, we’re talking about daily averages here, not daytime highs. In summary, we’re making ice now. 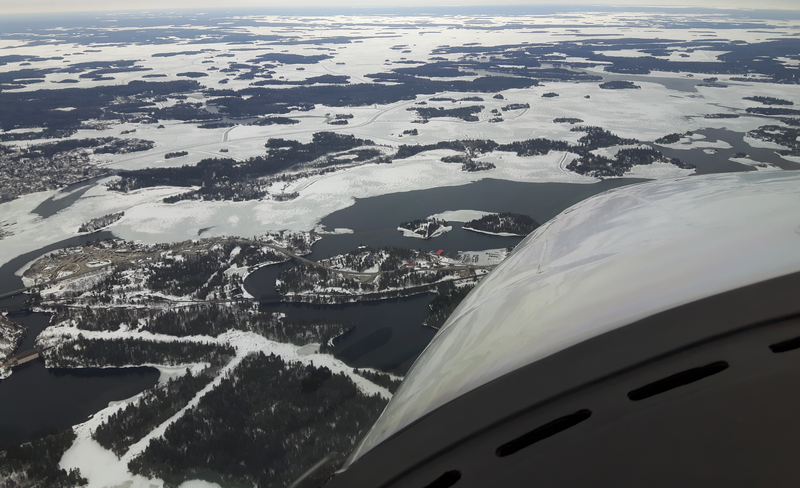 North of Red Lake, small lakes have been frozen since about the beginning of November, and on yesterday’s training flight, I saw small bays on Lake of the Woods were icing over. Strong winds were keeping larger areas from freezing, for now. This time of year, I always see an upsurge in emails and comments asking if I’ll be reporting on ice thickness. Ice fishers want to know! Sorry, I will not. I cannot judge the thickness of ice from an airplane, and I worry that if I report that a certain bay has frozen, people will take that to mean the ice is thick enough to support them safely. Someone sent this graphic my way. It doesn’t say which Department of Natural Resources, but I think the credit goes to Minnesota. 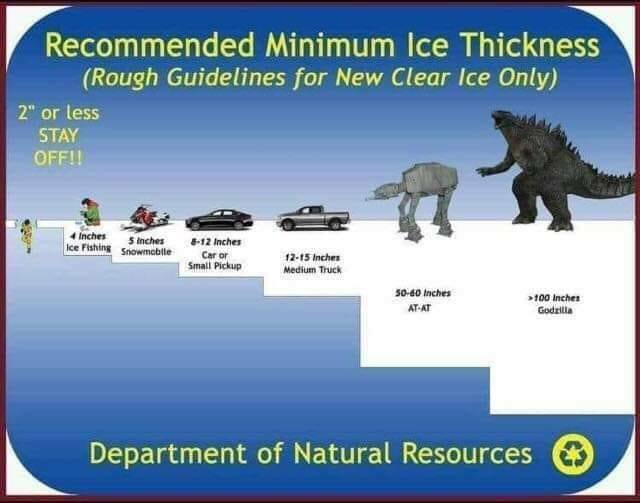 Note the caveat that these guidelines should only be applied to new clear ice. This time last year, we were enjoying daytime highs of about 11°C, and overnight lows above freezing. There’s nothing that warm forecast for the first half of April, and lately, we’ve been coming close to the record low temperatures. This morning, I saw that much of Safety Bay had refrozen over the Easter weekend. Things looked a little better this afternoon, but there’s more freezing than thawing going on right now. Looking south from Dufresne Island, that’s Highway 17A, the bypass, at the bottom left. Note the fresh grey ice near the bridge. 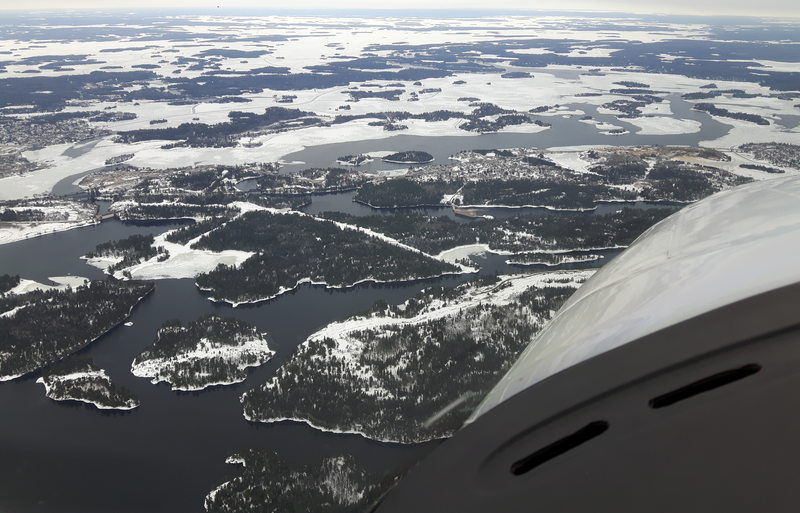 Looking further south, you can see Tunnel Island and all of Kenora from downtown on the left to Keewatin at the right edge. Now a closer look at the Norman to Keewatin stretch of Safety Bay. Don’t forget you can click on these pictures to see them full-screen and zoomable to full size. 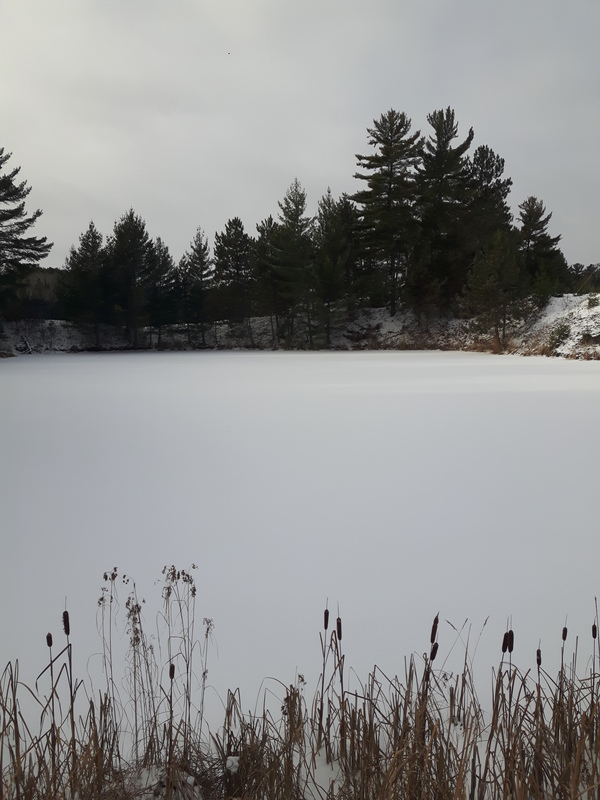 If you do zoom in, you’ll be able to see quite a lot of new ice, although it looks pretty thin and weak. 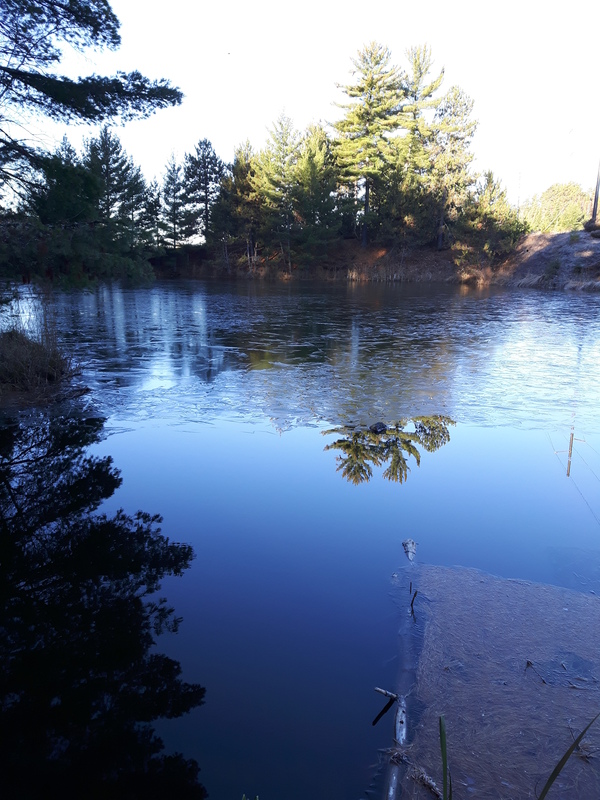 By this afternoon, it was breaking loose from the old solid ice. There still isn’t an open waterway from Safety Bay to Keewatin Channel. There’s open water around Channel Island, but it hasn’t even started to extend past Shragge’s Island yet. This next picture overlaps with the last, but shows more of the area near downtown. Coney Island sprawls across most of the photograph. In the background, Devil’s Gap still has only a little water, with no new expansion into Rat Portage Bay. 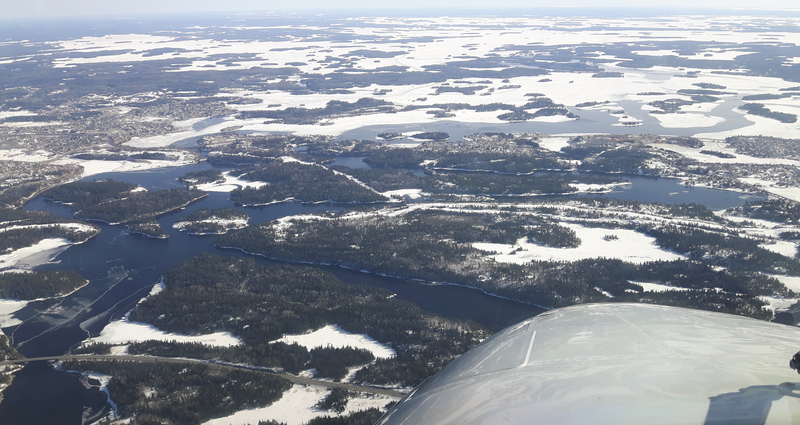 Beyond Treaty Island, it’s solid ice as far as the eye can see, with bright white snow cover. This isn’t going to melt fast, and there’s still a week of cold weather ahead before we can hope to start making progress again. Comparing today’s pictures to photographs from past years, I see a lot of similarities to how things looked in early April of 2013. That would suggest an ice-free date close to May 15, and we’d need a big swing to above-normal temperatures to improve on that. I hope I’m wrong, but I’m beginning to feel like a groundhog: six more weeks of winter. 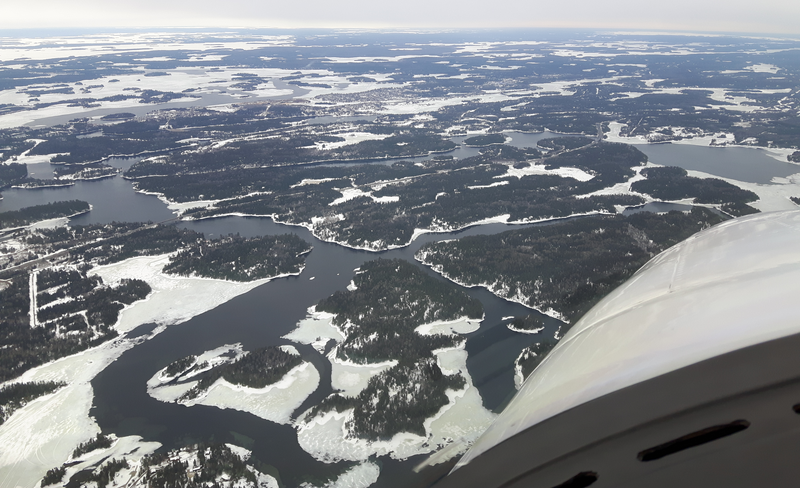 Today’s flight brought us to Kenora from the north, so Garrett and I cruised up the Winnipeg River from Minaki to Kenora. We had pretty good timing; skies were just clearing after a dull morning. You’ll notice a lot of haze in these pictures – that’s residual moisture from the clouds that just dissipated or blew away. I was startled to see how much more open water there was in the area around the Minaki bridge since the last time I looked. The Minaki townsite is just about dead center in this view looking west, and open water stretches from the left edge most of the way across the picture. The river channel is fairly narrow here, so there’s good current. Click on the picture to see a full-screen, zoomable version. Further south, the Big Stretch is wider, slower and frozener. There was no open water to be seen until we approached Cache Point, where the river narrows again. At the left of this photo, you can see where the river bends at The Dalles, and there’s a good stretch of open water all along there. Looking south from Little Dalles, with open water reaching Boudreau Island. If you zoom in, you can see Laurenson’s Island and The Powderpuff. It doesn’t look like the channel is open yet to go downstream from Powderpuff to Boudreau. 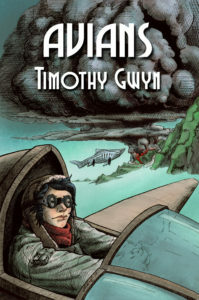 This shot is centered on Fiddler’s Island. My chart doesn’t name many of the other islands, so I apologize for being vague. Here’s the area where the power line crosses the river. Looking south west, with Tunnel Island at the wingtip and the hospital bridge at the left edge. Safety Bay has opened up quite a bit, but it’s hard to tell what the ice is like under all that fresh snow. Afternoon temperatures have been warm enough to melt most of that recent snowfall on land, but it will be more persistent on the ice. The Weather Network is still forecasting below-normal temperatures for the end of the week, with some overnight lows around -16°C and daytime highs as cool as -8°C. I have a couple more days of flying this week, so I hope to get out over the lake for some pictures before the Easter weekend. Then on Monday, I’m going out on the lake with my co-workers to get a first-hand look at the ice conditions. They’ll be the outdoorsy types with ice augers and fishing rods. I’ll be the nerd with the tape measure and notebook.